Provide comfort for the family of Suzanne Deeter with a meaningful gesture of sympathy. Suzanne Carolyn Poffenberger Deeter, 94, of Carlisle and formerly of Camp Hill, died peacefully at home on December 27, 2018, a faithful servant of her Lord and Savior Jesus Christ, surrounded by her loving family. Suzanne was born on June 15, 1924, in Sunbury, Pa., and graduated from Camp Hill High School in 1942. She attended Harcum College in Bryn Mawr before working at the PA Department of Revenue. A beloved wife, mother, grandmother, and great-grandmother, Suzanne was a homemaker and teacher at heart. She left a legacy of service to others through more than 25 years of Sunday school teaching at both Grace United Methodist Church on State Street, in Harrisburg, and at Discover Alliance Church in Camp Hill. She was active in nursing home ministries for 30 years with her husband, the late Edmund M. Deeter, Jr., as well as teaching Vacation Bible Schools, and active in Alliance Women, a women's missionary prayer fellowship. To her children and grandchildren, she was a priceless example of unconditional love and the anchor of the family. A faithful student of the Bible and prayer warrior, she lived what she believed and planted kindness, devotion, compassion, generosity, and grace in every conversation, whether it was with a loved one or a soon-to-be friend. Suzanne was preceded in death by her parents, Alfred S. and Kathryn A. Poffenberger, her dearly loved husband of 60 years, Edmund M. Deeter, Jr., and her sister, Mary Jane P. Collens. She is survived by four children, Edmund M. Deeter, III and wife Colleen of Malvern; Philip E. Deeter and wife Diane of Newtown Square; Anne Deeter Gallaher and husband Corey of Camp Hill; and Lisa Deeter Dymski and husband Jim of Carlisle. 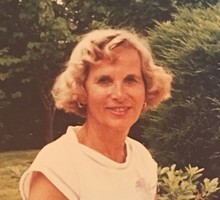 Feeling blessed to be surrounded by the laughter and love of her husband, children, grandchildren, and great-grandchildren, she treasured every minute of family beach vacations in Avalon, picnics at Pine Grove, Sunday drives, dinners with three generations at the table, storytimes, and babysitting. "Mimi" will be deeply missed by her 11 adoring grandchildren: Joshua M. Gallaher and wife Mallary, Aaron J. Gallaher and wife Samantha, Benjamin E. Gallaher and wife Monica; Andrew J. Dymski and wife Rachael, Christopher J. Dymski and wife Brittney, Brooke S. Dymski and husband Aaron, Grace K. Dymski, Jordan P. Deeter, Emily M. Deeter, Noah E. Deeter, and Abigail J. Deeter. Being present and faithful, even in her nineties, was a treasure to her great-grandchildren as well: Easton A. Gallaher, Hadley G. Gallaher, Knox M. Gallaher, Caroline J. Gallaher, June A. Dymski, Rosie J. Dymski, Eliza J. Dymski, and Lydia M. Dymski. A memorial celebration will be held Friday, January 4 at 11 a.m., at Discover Church (Christian & Missionary Alliance), 769 Meadow Drive, Camp Hill, Pa. with Pastor Jim Grumbine officiating. A private burial at Fort Indiantown Gap will be held at the convenience of the family. Memorial contributions may be made to The Great Commission Fund, c/o The Christian & Missionary Alliance Church, 8595 Explorer Drive, Colorado Springs, CO, 80920 or at www.cmalliance.org. Myers-Harner Funeral Home, 1903 Market St., Camp Hill, is handling arrangements. Online condolences will be received at myers-harner.com. To send flowers in memory of Suzanne Carolyn Deeter (Poffenberger), please visit our Heartfelt Sympathies Store. A private interment will be held at the convenience of the family. Donations are being accepted for: Christian and Missionary Alliance and Great Commission Fund. We encourage you to share your most beloved memories of Suzanne here, so that the family and other loved ones can always see it. You can upload cherished photographs, or share your favorite stories, and can even comment on those shared by others. Provide comfort for the family of Suzanne Carolyn Deeter (Poffenberger) by sending flowers.